Electronics Inc. (EI) manufactures and maintains the world’s largest inventory of Almen strips for global distribution. EI can provide strips to any specification, from standard MIL to rigid aerospace specifications. Almen “A”, “N” or “C” strips in Grades 3™, 2™, 1™ and 1-S™ are ready-to-use and are pre-qualified. Our “A” and “N” Almen strips have the lot number printed on both sides and a patented coverage check finish. These features add value to a quality shot peening process. *Grades 3, 2, 1 and 1S are trademarks of Electronics Inc.
A-3, A-2, A-1, A-1S, N-3, N-2, N-1, N-1S, C-3, C-2, C-1 are trademarks owned by Electronics Inc.
Almen strips are classified into 3 types: ‘A’, ‘N’, and ‘C’. They differ in their thickness but have the same width and length. The type of strip is usually specified by the part designer. “A” strips are used for medium intensity applications. “A” strips are predominantly used for shot peening with cast shot or cut wire shot. “N” strips are used for low intensity applications. “N” strips are used usually for glass bead and ceramic bead peening. “C” strips are used for high intensity applications. Grade 3 strips are guaranteed to meet the requirement of MIL-S-13165 (now AMS-S-13165). Type A-3 strip is guaranteed to meet National Stock Number NSN 6635-00-512-1892. Grade 3 strips are economically priced and bulk packaged. Meets AMS-S-13165. Excess oil is removed from the Grade 2 Standard strips. The strip surfaces are then visually inspected for score marks, scratches, nicks, burrs, pits and rust. Strips are certified using a sampling inspection plan for hardness, length, width, thickness, and flatness. A dated certification of compliance is issued, signed and archived. We then package “A” and “N” strips in groups of 50 and “C” strips in groups of 25. Grade 1 – Premium Grade (A-1™, N-1™, C-1™) Meets SAE J442. Electronics Incorporated performs all the inspection and packaging operations listed for Grade 2 strips. Strips are sample inspected for flatness (±.001-inch) on each side. A dated certification of compliance is issued, signed and archived. The Premium Grade 1 strips are identified by batch control number which provides traceability. Meets SAE AMS 2432B. In addition to requirements for Premium Grade 1, the Grade 1S strips are inspected to ±.0005-inch flatness tolerance of AMS 2432B. A dated certification of compliance is issued, signed and archived. * AMS-S-13165 has been cancelled with instructions to use AMS 2430. For more information see Almen Strips FAQ. 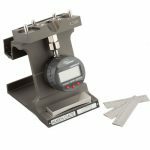 Note: Our strips are inspected in compliance with SAE standards that require the use of the #2 Almen gage for pre-bow measurements. Any other equipment, such as laser measurements, does not meet the requirements of SAE J 442 or AMS 2430. An Electronics Inc. staff member tests Almen strips hardness. EI is responsible for every aspect of the manufacturing process to ensure that our strips are of consistent quality and give repeatable results. The Almen strip arc height is a function of the energy of the shot stream and is very repeatable; therefore, for Almen strips to provide reliable and repeatable intensity verification, it is critical that they are consistent in thickness, flatness and hardness. The purpose of EI’s testing program is to verify that the strips will perform consistently, from lot to lot, from year to year. 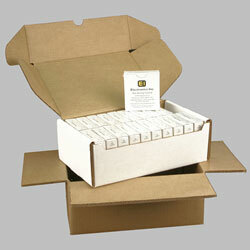 Sample sizes of 39 to 40 strips are used in each test cycle. The strips’ prebow is measured and recorded. 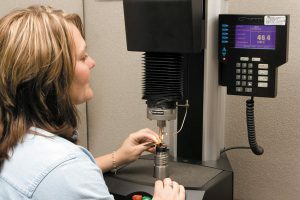 After each test cycle in an air blast cabinet, the arc heights are measured on a calibrated Almen gage and the prebow compensation is applied. The values are put into histograms for analysis. Histograms exhibit nearly identical lot-to-lot arc height results, thereby verifying the uniformity of the strips. We maintain a large inventory of each type and grade of strips. We ship worldwide and we strive to ship your strips the same day the order is received. Now you can quickly and accurately create Almen saturation curve graphs with Dr. Kirk’s Almen Saturation Curve Solver program or the Electronics Inc. PeenSolver Web App. Q: What determines if an Almen strip is an “N”, “A” or “C” strip? The thickness determines a strip’s ability to arc during peening so each strip has an appropriate intensity range, as expressed by the arc height measurement from an Almen gage. The “A” strip is considered the standard strip and is used when the required intensity range is an arc height of .004” – .024”. When an arc height lower than .004” is required, the thinner “N” strip should be used. The thicker “C” strip is used to achieve an arc height above .024”. The Almen strip is sensitive to thickness variations, as can be seen by the relationships among the three strip types. An “A” strip deflection of .005” would result in approximately .015” deflection of an “N” strip. The standard tolerance for thickness, ± .001”, would therefore allow approximately ± .0004” variation in expected curvature reading. For automotive applications this may be acceptable, but for aerospace applications it could be unacceptable. Therefore the ±.0005” thickness tolerance, which would translate into a ± .0002” curvature tolerance, is required for most aerospace applications. Q: What grade of Almen strip (1™, 2™, 3™, or 1S™) should I use? A: For most general purpose shot peening applications, namely automotive and gears, you can rely upon the Grade A-2™ of Almen strips. For more critical applications, such as aerospace, a tighter tolerance may be specified for flatness (pre-bow) and hardness so you should use A-1S™ strips. 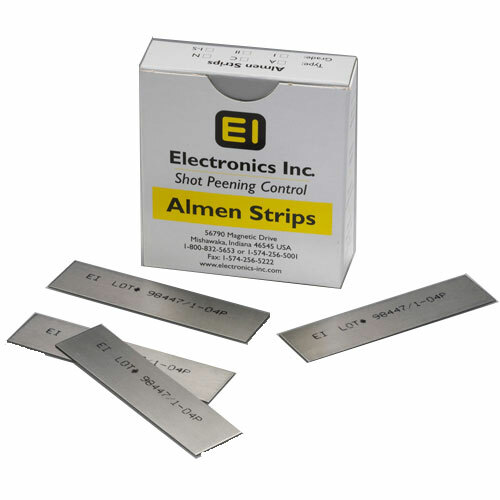 Electronics Inc. Almen strips are graded primarily by flatness (pre-bow) and hardness. The three most common flatness tolerances for the “A” strip are shown below. 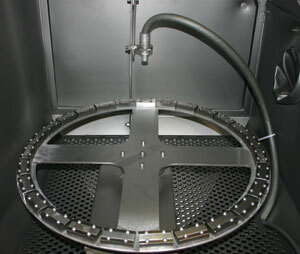 The hardness requirements are halved for aerospace applications. The hardness tolerance of HRc 44-50 is standard for automotive applications and 45-48 HRc is required for aerospace applications. The thickness tolerance ± .001″ is common for automotive applications and half of that tolerance (.0005”) is allowed for aerospace applications. 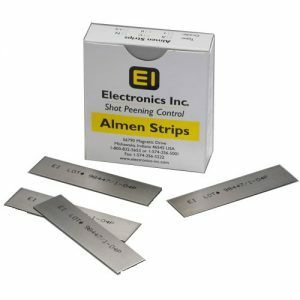 Note: A-3, A-2, A-1, A-1S, N-3, N-2, N-1, N-1S, C-3, C-2, C-1 are trademarks owned by Electronics Inc.
Q: Why is necessary to use Prebow Compensation in an Almen strip test? Peen a strip with .0000″ prebow until it arcs .010″. The change in arc height was .0010″. Peen a strip with a +.001″ prebow using the same conditions and it will measure .0110″, but the “change” in arc height was .010″. Peen a third strip with a -.001″ prebow using the same conditions and it will measure .009″, but the change in arc height was .010″. All three strips had an increase in arc height of .0010″. Without prebow compensation, however, the recorded arc heights would have a range of .002″ (.009″ – .011″), which could be more than half of the allowable peening tolerance. Q: How does the cancellation of 13165 affect my choice of Almen strips? A: It depends upon your quality procedures. You may be required to use the latest version of AMS-S-13165 which is the cancellation notice with a re-direct to AMS 2430. If that is the case, you should select strips that meet the requirements of SAE J 442. Otherwise, you may continue purchasing strips that meet the requirements of 13165. Q. What are the best practices for handling and storing Almen strips? A: It’s not very common but, if Almen strips are improperly handled or stored, they can develop rust. Fortunately, our packing methods and a few simple precautions will protect the surface of the test strip. Do not removed the shrink wrap covering the box of strips until the strips will be used. Do not discard the VCI (Volatile Corrosion Inhibitor) paper after opening the box. VCI paper is a very effective material for preventing rust and corrosion. Always return unused strips to the original EI box and replace the VCI paper, making sure the unprinted side of the paper is in contact with the strips. Electronics Inc. packages bulk Almen strips in blue VCI polyethylene bags. In addition, EI places a 12” x 12” sheet of VCI paper in the bags. The Almen strips should remain in the blue bag until the time of use. Always return unused strips to the VCI bag and replace the VCI paper, making sure the unprinted side of the paper is in contact with the strips. Before returning Almen strips to storage, close the blue VCI bag. Fold the leaves of the box to close it tightly or tape the box shut. Do not leave the strips open to the environment. Recommended storage conditions are 65°-75°F (18˚C-24˚C) and a 20% – 60% relative humidity. Q. Why are these test coupons called Almen strips? A: The strips are named after John Almen, an engineer at Buick Motor Division of General Motors in the 1940s. Mr. Almen discovered that automotive valve springs had fatigue life improvements after shot blasting. He realized that the periodic measurement of the shot blast would be necessary to achieve reliable and repeatable results. Knowing that shot blasting would distort and bend sheet steel, Mr. Almen developed a small test coupon that reacted to the intensity of the shot blast stream. The coupon curves upwards in the middle in response to the intensity of the shot stream. The amount of upward deflection, the arc height, is measured by a gage that is now called the Almen gage. Today’s Almen strips are precision springs made with tight tolerances from SAE grade 1070 steel. Electronics Inc. recognized the importance of these tolerances and developed a family of graded strips with tolerances matched to industry applications, from low-cost automotive applications (grade A-3™) to critical aerospace applications (grade A-1S™). Q. Why isn’t there a “B” Almen strip? We all know that there are three strips used to qualify the intensity of a shot peening machine. Each of the strips has a different thickness. The “A” strip .050″ thick was probably named for J.O. Almen who conceived the idea of using a strip of C-1070 cold rolled spring steel to qualify the intensity of peening on coil springs. The “N” strip .030″ thick was developed by Charles Noble as the “A” strip was not sensitive enough to measure low intensities used on jet engine parts. The “C” strip is .094″ thick and used to measure high intensity shot peening. I attended a dinner at an SAE Fatigue, Design & Evaluation Committee meeting some years ago. The entertainment for the evening was an amateur magician named John Straub. What some of you may not know is that John Straub was J.O. Almen’s assistant at the GM laboratories, and was involved in much of the early experimental shot peening. Later on he directed the Wheelabrator R&D shot testing laboratory, where he developed the Wheelabrator shot testing machine. Among other things, John was a proponent of excluding fines in operating shot mix for optimum peening results. He also authored many papers in the late 1940s and also holds a patented dual intensity peening process. When he finished his astounding demonstration of magic, John was asked by Dr. Ralph Stevens, University of Iowa, to relate some of the early events of shot peening in which he was involved. The question was asked why there was no “B” strip. John replied that during World War II the government was investigating the attributes of the German “Tiger” tank over U.S. tanks at the Aberdeen proving grounds. It was found the Tiger had shot peened torsion bars, which gave them a greater fatigue life over U.S. tanks. A deep depth of compression was required in the surface of the bar. The peening intensity was too high for the “A” strip, which warped under the shot impact. So a “B” strip of approximately .078” thick was tried. But it was also too thin. The “C” strip of .094 was finally developed for the application. The “B” strip was superfluous as the “A” and “C” strips cover the intensify range. The “B” strip was discarded and not used again. There was another “B” strip used by the Douglas Aircraft Company. However, it was made from aluminum and used primary to determine coverage on aluminum aircraft parts. Learn more about the EI Almen gage including its patented magnetic grip and foolproof end stops.